butter LONDON's Spring/Summer 2012 polish collection features five shades - Bossy Boots, Disco Biscuit, Trout Pout, Slapper & Knackered. The range has quite a few nice shades to choose from and all shades are permanent additions to the line. Bossy Boots - A light, medium green with a creme finish that goes on very opaque. You can easily get away with just one coat. I applied two for swatches. The formula was a little thick and took quite a bit of time to dry. Trout Pout - butter LONDON describes Trout Pout as "An opaque shade of cantaloupe, pale and retro". It is very bright, perfect for my toes than on fingers. This one was quite opaque in one coat too and took about the same time as Bossy Boots to dry. Disco Biscuit - Hot pink with iridescent blue and purple shimmer in a jelly base. Amazing color that needed three coats to be quite opaque. You could add a fourth coat for complete coverage but three coats took long enough to dry. The color is just so pretty and perfect for Spring/Summer. Knackered - A purple/green duo chrome with hints of grey with holographic glitter. Very beautiful, unique color that needs 3 coats. It is quite sheer and looks stunning over a cream base than on it's own. As much as I like the uniqueness of Knackered and Disco Biscuit they chipped on the second day on my fingers. Knackered started to peel off and Disco Biscuit had a lot of tip wear on the same day. They would probably wear better on toes. Bossy Boots and Trout Pout were slightly better off and lasted just a day longer. Love the colors, just wish they wore a little better on me, especially the ones with glitter considering the price tag. Overall, if you like unique colors, this collection offers some really nice ones worth trying. I'm also glad butter LONDON polishes have a smaller brush that works perfectly well on short nails like mine. 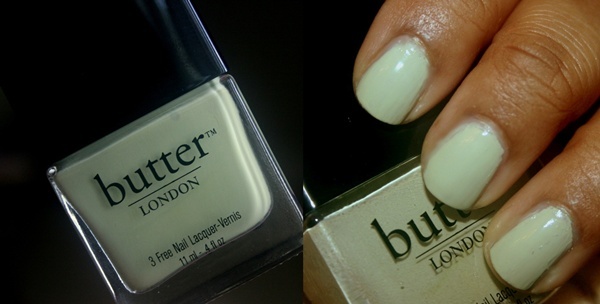 butter LONDON ($14) nail polishes are 3-free. 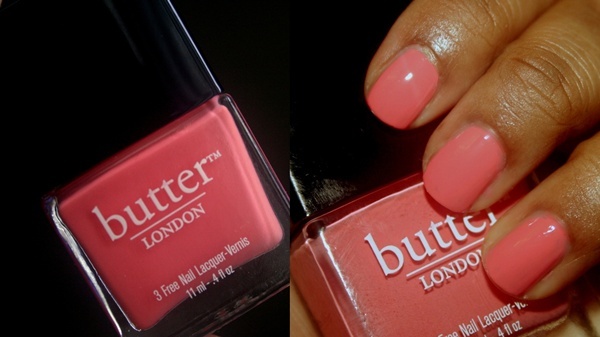 What are your thoughts on the butter LONDON Spring/Summer 2012 Collection? I have been looking at Trout Pout for ages, and love the color! I think that will be one of my next purchases! What is the staying power like? It is a lovely spring/summer shade, right? It started chipping on the third day of application on me! 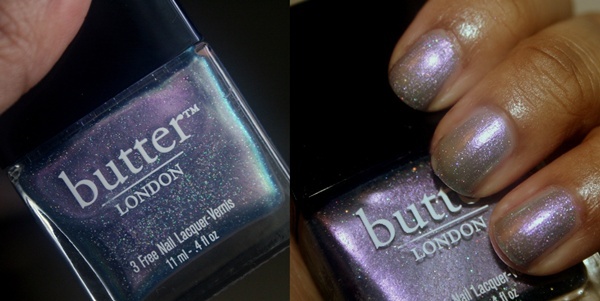 I've had a lot of chipping with Butter London nail polishes too...But the colors are pretty! I know! Too bad, right? I thought it was only for me.